← ImaginAction Apprenticeship 2013 in Belfast, Northern Ireland!! 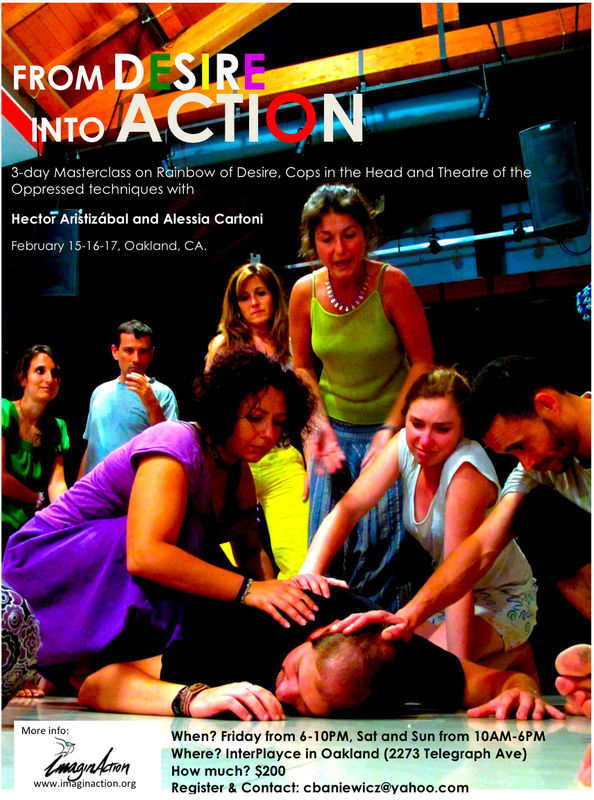 From Desire into Action: Coming to Oakland February 2013! Imagine if you could slow the voices in your mind enough to speak with them, honor them, learn their needs and mobilize them on your own behalf. Imagine doing this in a group, while laughing. Now imagine being led through this transformative experience by a pair of master artists committed to healing and social justice, with more than 30 years of combined theatre work in communities around the world. Imagine all of these things, and get excited, because Hector and Alessia are coming to Oakland! In this 3-day workshop, Hector Aristizabal and Alessia Cartoni will introduce basic Rainbow of Desire and Cops-in-the-Head techniques in order to explore our desires and confront our internalized oppressions. They will use drumming, storytelling and Augusto Boal’s methodology “to make visible the invisible” and engage in our most important human struggle: the struggle to become ourselves. This workshop is ideal for practitioners working with marginalized groups, people interested in mental health and healing, as well as teachers, artists and activists. This masterclass can only accommodate 30, so please RSVP with Christine at cbaniewicz@yahoo.com to make a deposit and reserve your space! For more details, click here to see the Facebook event.